The beauty of pricing items is that you choose your prices! To make the most money at an event, price to sell keeping in mind the quality, name brand and condition of your items. We suggest starting at 1/4 to 1/2 of their original purchase price. Is the item a boutique item or new with tags still on it? Then the higher end of the pricing scale is suggested. We also suggest you discount your items for the half price sale to make the most of this selling opportunity. Price your items in $1.00 or 50-cent increments. So no "99¢" pricing or other dollar increments, please (plus that just makes the mental math so hard, doesn't it?). Not sure what price to use? Use our JBF Pricing Guide (PDF) to help you figure out the best price for your items. You will find listings of items and some general suggestions to help with your decisions. If you wish to donate your items at the end of the event (and thank you SO MUCH if you do! ), select "Donate" on your profile in the tagging system. The word "donate" will appear on your tags. Any items with tags that say "donate" will be donated to local charity partners only in the event they do not sell. You can pick and choose which items to donate and which ones you would rather not donate. As it is such a help to local charities, we encourage donating unsold items. It really blesses so many people and it makes it easier for you at the conclusion of the sale as you do not have to return to pick up anything that did not sell. 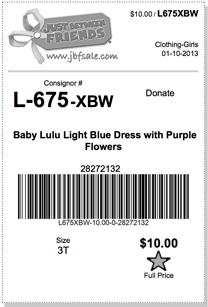 A red star on the tag indicates that you DO NOT want the item discounted. A red star tells the customer that the item will remain full price and will not be discounted on half-price day. This is another choice you will have in the tagging system where you can choose whether or not to star your items. To make the most money possible from your items, we DO suggest you allow them to sell at a discount. We are unable to accept any items that have handwriting on the tags. If you need to change something on a tag, you will need to print a new tag for that item. This way, you can be sure you have the most accurate information in your account and also, that your item will scan properly at check out. Many sales maintain a "$3.00 Minimum Rule." If your single, hanging clothing item is not of a $3.00 value on it's own, please pair it with something that will bring the total for the items to at least this amount. You can pair two onesies together, for example. Please note this only applies to clothing, not toys/equipment. Check with your local sales website for more information about minimum pricing policies. No Star = if an item does NOT have a star below the price, it will be 50% off at the half-price sale!